Why am I writing about design in a blog that shares interesting information about SEO, social media marketing and business? That is easy. In this day and age, all of us entrepreneurs, as well as business owners start to become a little bit of everything. And, even if we are not designing our own social media graphics or our next video strategy, it helps if we understand the process, at least a little bit, so that we are able to make more qualified business hiring decisions and select eh contractors that are the best for the gig/job. After you read this article, you may feel that you do not need to hire the best designer on the planet and that you can cut some costs and do it yourself. Ok, let’s not leave out the truly talented designers. There is still a place for them in this online world and while I say that you can reach that level of “pro,” this one article is not going to elevate you to a position comparable to the truly great designers among us. With rules, come opportunities to break the rules. The key, with design, is to know which rules you are breaking and to break them deliberately. Also, you will not likely want to break all of the rules, or why bother with them in the first place? 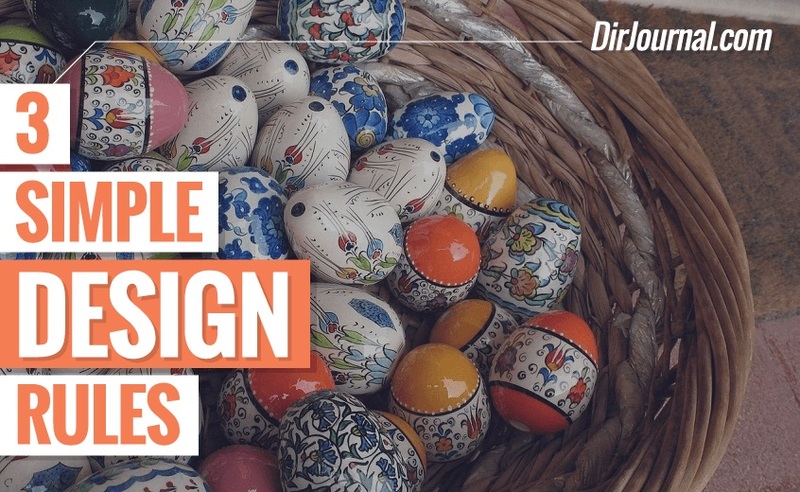 These design rules that I am going to share are standard in the industry and there are way more rules or principles that you could conjure up, beyond just three. What is my basis for presenting these? Two things. First, I used to teach advanced Adobe Photoshop to illustrators and professional photographers. It was my students that were truly the gifted ones! Secondly, within my college degree (the BSIT), I took design classes, where they drilled these rules into or heads, and then let us go out and break them, as needed. For this section, I grabbed an existing graphic that I found online. However, in order to protect the innocent, I recreated it so that I can show you each of the elements, as we correct them. Let’s start by listing the three rules and then we will work through the graphics, ok? Spacing: Give it room to breathe! All three of the rules are broken frequently and it isn’t pretty! The first one, fonts, isn’t broken as much. People tend to like the idea of using similar fonts in their design. However, I did recently see ads on one of those restaurant placements and I swear the advertisers were having a contest to see how many different font styles fit in a one inch block. That aside, let’s look at each of these rules, briefly, and then illustrate them. I am not going to give you the finished product (design), because I want you to envision that yourself. If I give you something to copy, you may not realize the playing field that is open to you. Instead, we will look at the before/after version and the “why” aspect behind it. For the fonts, you should not have more than three different font styles. That includes variations, like weight (i.e. bold) and style, like italics. Definitely, that includes the font face (i.e. Geneva, Helvetica, etc.). Also, you may want to look at the combination. For example, do you want to include serif (curly) and san serif (not curly) fonts in the same design? Maybe you do, if you want to highlight the text in the serif font. Also, the smaller the area, the less fonts. If you box is 125×125, you may want to limit it to two different fonts. It seemed to me, in looking at it, that the creator fell in love with the ability to add anything and everything. Some of the elements were ok, but there is just too much. Also, there is not a consistent theme (color or design), os it has someone wondering what the objective is, with the graphic. Ok, that goes a bit beyond the three rules. So, let’s keep it within those rules and see what we can do to start down the path of improvement. This is an incomplete image. However, you will notice that I limited it down to only two different fonts and one of them is the font that is already designated for branding (lower right, domain name text). For the spacing, there is a consistent spacing around the images. If you use the Canva tool, it will even provide that to you, as you are designing. I also removed some of the text. There is a spot in the middle, to add more text, but there were so many “Come Join” text blocks in the “before version,” that it just caused clutter. In analyzing your design, help to define the objective. In this case, it is a sort of invitation type thing, so I picked a script font. The details of the event or invitation could also be included under the “Come Join us!” text and that could be the third font, as Arial or Helvetica (to help keep the “Come Join Us” as the focal point, with the script font). The spacing is addressed by ensuring that no images are cut off and that there is a margin around the images. Too many times, people seem to figure if it fits in the graphic that it is ok, but images need space and margin, in order to look professional. Did anyone tell you the rule about accessorizing? If you are a glamour junkie like me, you probably have heartd it. If you are not, here it goes.. The idea, when getting ready to go out is that you accessorize and then remove at least one item and that is the perfect quantity of accessories for the classy dresser. The same goes for design. When adding elements, look at what you have and remove. This will help your deisng to look more professional. In this case, I would be likely to remove the coffee cup image. I added it to replace the overlapping multiple non-color-matched cups on the original graphic, helping it to be less busy. But, if I were to re-create this (which technically I am doing), I would remove that and focus more on the simple text (including where to find information) and the photos of the presenters. Fortunately, we have several tools available to us. These tools were not even available to us a few years ago, in some cases. We have royalty-free images to choose from, as well as ways to share those images. Now, it makes sense that we get out there and put our best foot forward with the best looking images we can produce. And, you are now equipped with just a little bit more information in that direction. Have fun! I just like the worthwhile details in your articles and blog posts. Great source. I’m going to bookmark your web site check here frequently. I am fairly specific. I’m going to study lots of completely new things right here! See you next time!